The Annual Luncheon & Business Expo is one of the organization’s premier events, as well as being the largest business luncheon in the Greater Houston region. The Chamber's Health, Innovation & Technology Summit is an initiative that highlights emerging trends and technologies that are empowering businesses to reach new heights. In-depth analysis of the Hispanic community in the Houston area and its impact on our local economy. 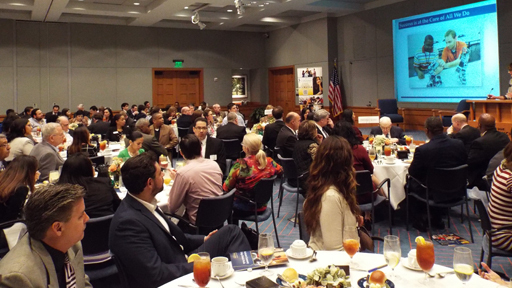 Held in appreciation of the Houston region’s elected and appointed officials, the Houston Hispanic Chamber of Commerce’s Elected Officials Reception is one of the most preeminent events of its kind in the region. The Annual Awards recognizes the successes of entrepreneurs, business, and executives across the Houston area. Attended by more than 1,000 people annually, the Annual Awards is the most well-attended Hispanic gala in Houston. The Chamber's networking & business development expos help connect members with long-lasting business opportunities and professional contacts. The Annual Women’s Leadership Conference & Business Expo highlights the accomplishments and successes of women across all industries and seeks to empower all people – men and women – to reach higher in their personal and the professional lives.